Malcolm McCormick (born January 19, 1992), known by his stage name Mac Miller (previously Easy Mac), is an American rapper from Pittsburgh, Pennsylvania. He is signed to Rostrum Records. 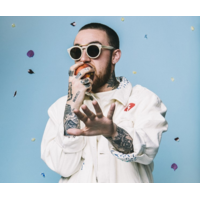 Mac Miller was born Malcolm McCormick on January 19, 1992 and raised in the Point Breeze part of Pittsburgh, Pennsylvania, the son of an architect and a photographer. His father is Christian and his mother is Jewish; Miller was raised Jewish and had a Bar Mitzvah. Before attending Taylor Allderdice High School, Miller attended Winchester Thurston School. In high school, Miller decided to focus on his hip-hop career, later noting, "Once I hit 15, I got real serious about it and it changed my life completely... I used to be into sports, play all the sports, go to all the high school parties. But once I found out hip-hop is almost like a job, that's all I did." Miller, also a self-taught musician, plays piano, guitar and the drums. Before his solo career, he was part of a rap group, The Ill Spoken with fellow Pittsburgh rapper, Beedie. Upon turning 18, he signed with Rostrum Records and released his mixtape debut, titled K.I.D.S. with the label in August 2010.